Orme Square is named after its developer, Edward Orme - see there for his Russian connections. The monument's form, a double classical column, suggests a 19th century date. The bird is surely an eagle. So, it could be an Imperial Eagle, but which one: Roman, Eastern, Russian, Holy Roman, French, Nazi? Or the American eagle? Or is it just a bird at the top of a pole? Taking the date and the location into account two of these suggestions deserve serious consideration: First: the Russian Imperial Eagle. Orme’s reported connections with the Russian Tzar supports this suggestion but the Russian Eagle pretty consistently has two heads, while the Orme eagle has the more usual one. The double pillar doesn't make up for a missing head. Second: the French Imperial Eagle. With Napoleon finally defeated in 1815, and two of his armies’ eagles captured and brought to London, Orme could have erected this eagle to commemorate that great victory. The French Imperial Eagle has only one head and stands on a plinth. So far so good. But one claw should be resting on Jupiter’s spindle (indicating fate). The Orme eagle has forgotten his spindle. On balance we think this is probably a celebration of the victory at Waterloo erected by Orme, but we are open to other interpretations. A date and a sculptor would be good. 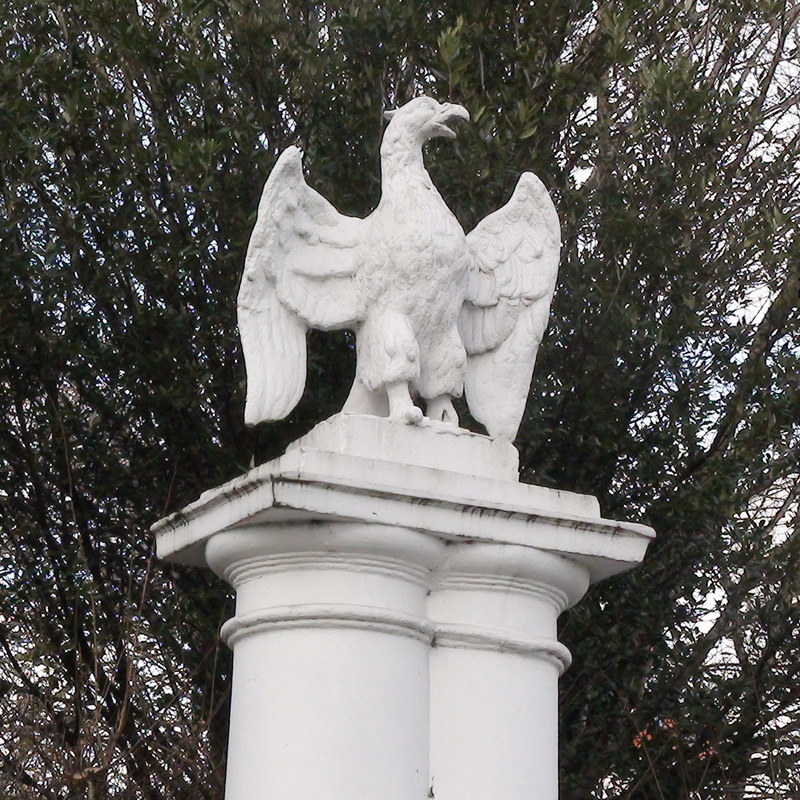 London has, at least, two more eagles on columns: the RAF monument and at Eagle Squadrons.